A few months ago, I got tired of the constant “media file error” messages Downcast was sending me and began looking for another iOS podcatcher. Download control. Of the podcasts I subscribe to, some I listen to every episode of and others I listen to only when the guest and topic seem interesting. Of the former, I want every episode downloaded automatically; of the latter, I want episodes downloaded only after I’ve read their descriptions. Playback order control. When I set off on a bike ride or a long drive, I like to have playback set to continuous play and have a series of episodes queued up in a particular order. This allows me to move from one show into another without swiping or tapping at the user interface. Skip ahead/back. As much as I appreciate their sponsorship of podcasts I like, I really don’t need to hear another Squarespace ad. Other aspects of the user interface will color my opinion of an app, but these trump the rest. 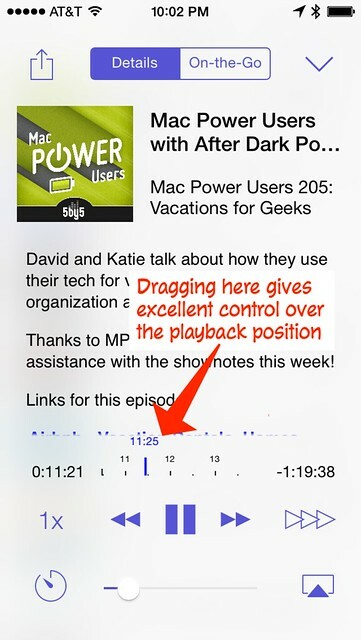 I gave Instacast another shot, and the experience was, if anything, worse than the last time I tried it. Not only is the layout of the app not to my taste, the skip ahead and skip back buttons did absolutely nothing. To be fair, I reinstalled Instacast after it was updated earlier this month, and the skip buttons in the newer version worked just fine. Still, it’s not the app for me. Pod Wrangler has perhaps the best scrubber in the business, and I have free access to its advanced features because I use Feed Wrangler as my RSS sync service. But it doesn’t give me download or playback order control I want. Castro gets points for the pun in its description—high fidelity podcasts—has a scrubber on par with Pod Wranger’s, and has a fun interface overall, with almost all the navigation done by swiping left and right. But the playback order control wasn’t there. Pocket Casts was a very strong contender, with all the controls I need. Like Castro, it has a fun user interface. 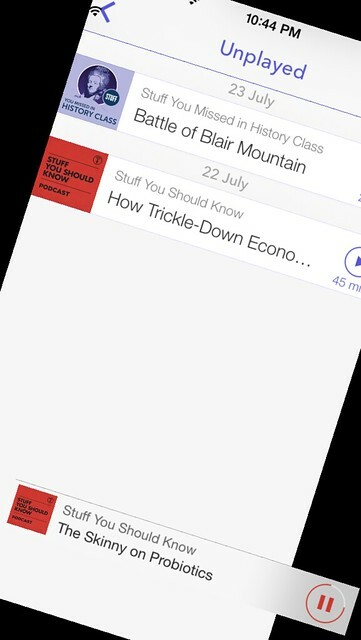 When you turn your phone over in an episode list, for example, the main body of the screen turns in place, but the mini-player strip “falls” from one end of the screen to the other. One thing I dislike about Pocket Casts is its sleep timer. Instead of just having a button to set the timer, it forces you tap a button and then move a slider. Not only is this awkward and slow, it’s unnecessarily precise. No one needs to-the-minute resolution on a sleep timer. Still, because it had most of what I find essential in a podcast app, Pocket Casts had taken Downcast’s spot in my dock. Until I got invited to try the Overcast beta. By now you’ve probably read several reviews of Overcast, so you don’t need me to tell you about its two killer features: Voice Boost and Smart Speed. I will, however, suggest that you experiment with both of them instead of just turning them on for all podcasts. If a show tends to be well-recorded, the equalization of Voice Boost is unnecessary and will simply make the overall playback louder. This may not seem like a big deal, but I noticed on a recent car trip that Siri’s turn-by-turn instructions—which are usually at the same volume as whatever I’m listening to—were much quieter than the Voice Boosted podcast she was interrupting and were hard to hear. On the other hand, certain guests on In Our Time are so soft-spoken that even the heroic efforts of BBC’s recording engineers to turn up the gain can’t make them as loud a Melvin Bragg or the other guests. I expect Voice Boost to be a big help with those shows. And while it’s nice to have dead air reduced, I wouldn’t use Smart Speed on The Bugle, because comedy relies on timing—including pauses. I’ve also found that John Siracusa without pauses is exhausting. My favorite feature of Overcast is the natural way it allows you to reorder the episodes in any playlist. Just tap the Edit button in the upper right corner and start dragging. This is a big advantage over Pocket Casts. 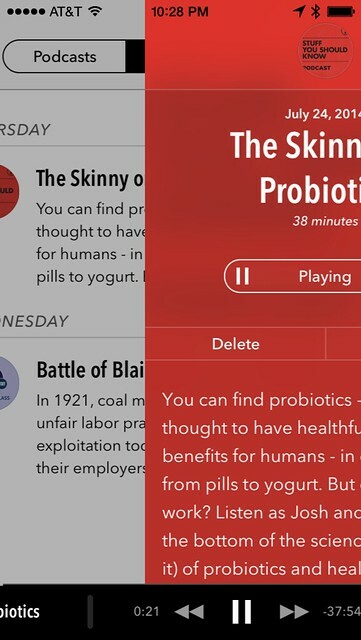 In Pocket Casts, smart playlists—which it calls Filters—do not allow arbitrary reordering. Only playlists created by hand allow that. So you have to move episodes into an ad hoc playlist before you can set their order. This is not the greatest burden in the world, but the freedom Overcast gives you to rearrange smart playlists is clearly superior. I haven’t felt the need to make any new playlists in Overcast; I just rearrange episodes in the Unplayed list. You might be wondering why I’m writing this post a week and a half after Overcast was released. It isn’t because I needed extra time with the app, nor is it because I’m lazy.1 When Overcast came out, I had just shifted back to Pocket Casts as a test. I figured that if I were comfortable with Pocket Casts after using Overcast, then there really wasn’t any reason to switch. 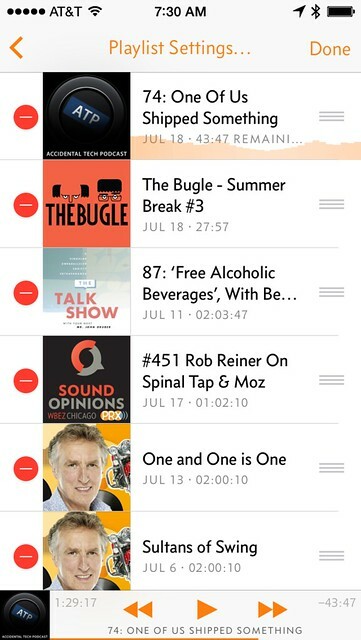 But after a week of Pocket Casts, I found myself still missing features in Overcast. 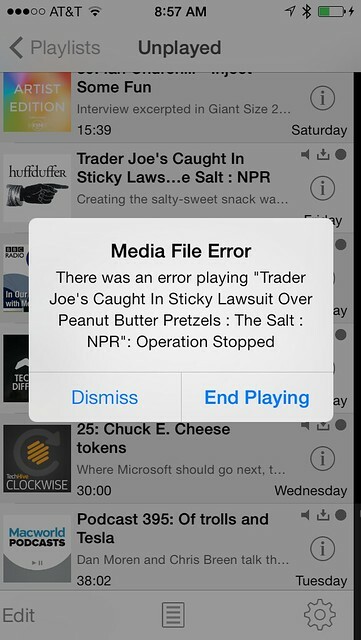 That’s when I knew Overcast was going to be my podcast app. Overcast is by no means perfect. I have, for example, occasionally seen error messages similar to the “media file error” messages that drove me from Downcast. Fortunately, those have been quite rare and they’ve never caused Overcast to crash. So my months-long search for a podcast app I’m happy with is over.